Ever wonder how to cook a pumpkin? The best, easiest way is to toss it in the slow cooker. 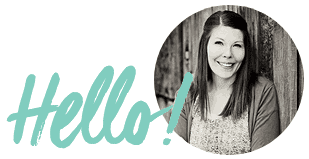 This post will explain all the details! 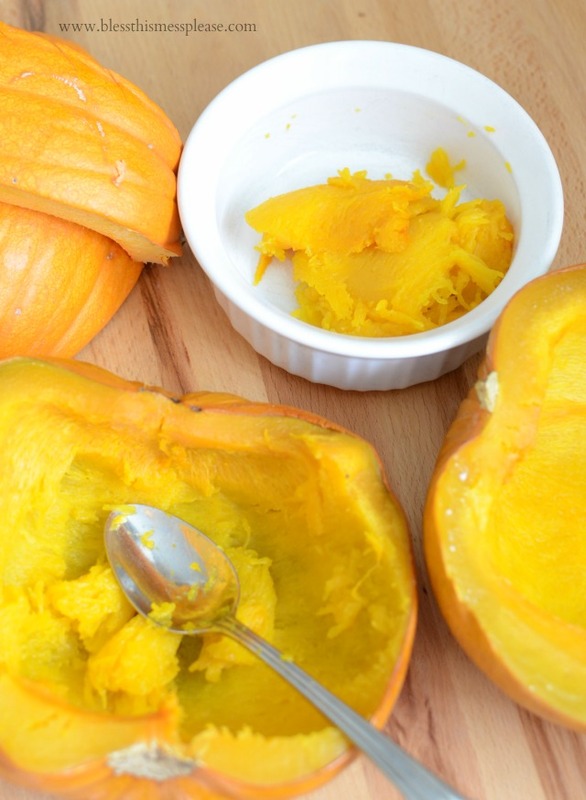 Have you ever tried to cook a pumpkin to use in a recipe instead of buying canned pumpkin from the store? I always think that it sounds like a fun idea but I rarely do it. A few years ago, I cooked a small pumpkin in the oven and what didn’t stick to the pan tasted too roasted to enjoy in sweet dishes. My quest for a better option started early this year when I decided to plant sugar pumpkins in my garden. They grew well and now I have about a dozen sitting on my porch! Cooking a fresh pumpkin is fun and simple. You should try it this fall just to say you did! After a bit of research, I decided to try to cook a pumpkin in the slow cooker. My friends, this method is perfect. The pumpkin stays moist, it scoops out easily, there’s little clean up, and it practically cooks itself. 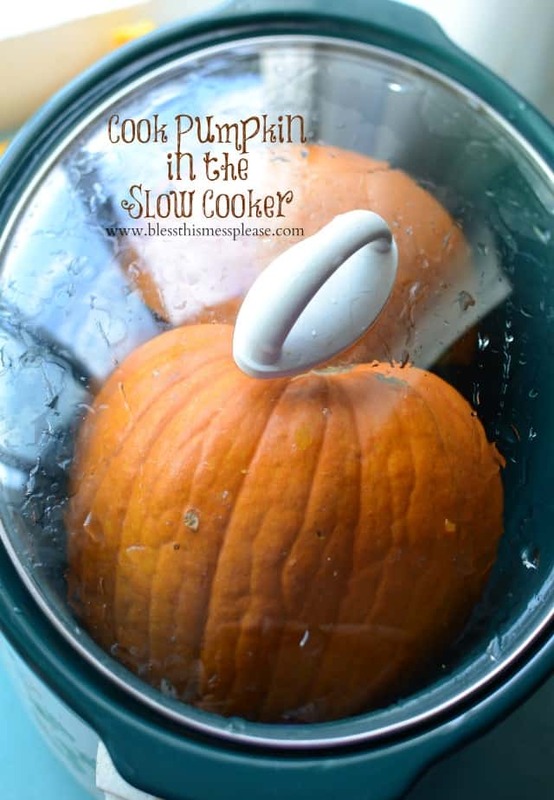 The day that I was in the kitchen trying out this method, I planned on cooking 2 of my pumpkins in my large slow cooker at once. 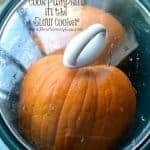 When they were finished cooking and my warm slow cooker was still on the counter, I grabbed 2 more pumpkins to cook just because it was so easy. I love this method! Ever wonder how to cook a pumpkin? The best, easiest way is to toss it in the slow cooker and let it cook on its own! 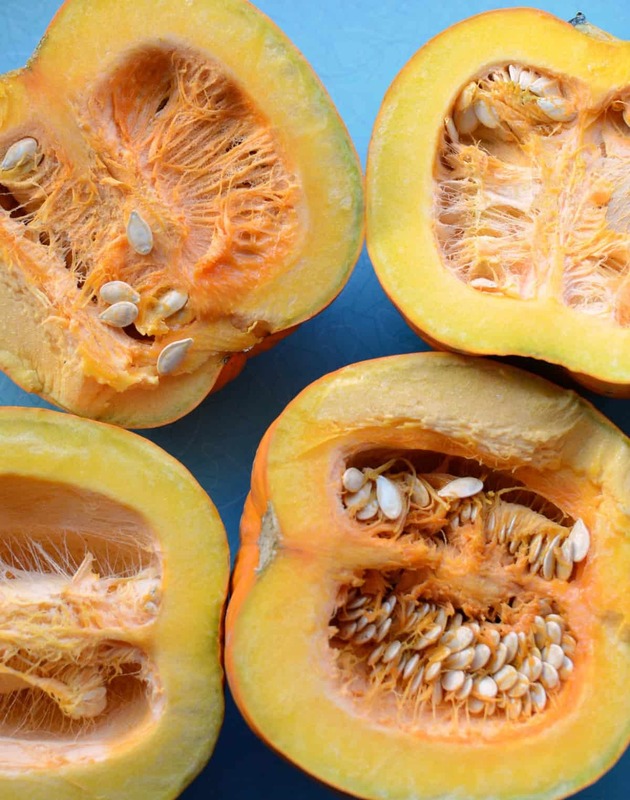 Store pumpkin flesh in the fridge for up to a week or in the freezer for up to 6 months. If the pumpkin isn’t fitting well in your slow cooker, feel free to cut it into a few more pieces. 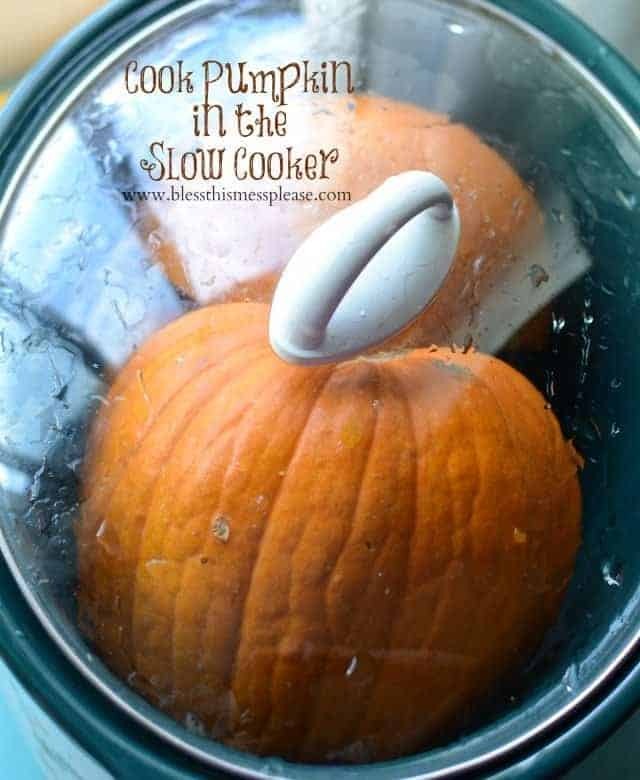 This is for sure the easiest way to cook a pumpkin but it isn’t the only way. You can also bake your pumpkin. It’s a bit quicker than this method, though there is a little more clean up involved. You can see my baked homemade pumpkin puree recipe here. This post was originally published in October 2014 and has been updated and republished in October 2017. I need to get a bigger crockpot, I just have a teeny one I got as a wedding present. What size is yours? This method is brilliant! I’ve only baked a pumpkin once and I agree, the cleanup and all was a bit too much for me. Can’t wait to try this method! I bought a bunch of big ones after Halloween one year (when they were $1 a pumpkin) and roasted them all in the oven, scooped out the flesh, drained it to the right consistency and had little 1 cup baggies of pumpkin puree in my freezer to use in recipes for months! It was great to get so much pumpkin for so little money, but the hassle made me wary of trying it again. I’ll have to try it again in the slow cooker! I cook my pumpkins in the microwave. Cut them in half and clean them out. Put one half cut side down in a microwave-safe pie plate or similar dish, add about 1/2 inch of water and set in microwave. Cook on high for maybe 10 minutes, then 2-3 minute intervals, until pumpkin is squishy soft. (Pinch the shell) (You may have to add additional water during the cooking process) Remove from microwave, and scoop pumpkin from shell. I then process it in a food processor. It’s quick and easy! Are all face pumpkins, sugar pumpkins?? I have 3 on my patio waiting to get done! Nope, most pumpkins grown for carving are the variety called Connecticut Field pumpkins. Most Sugar pumpkins will be labeled as such in the store. You can cook your pumpkins though they are just a little less sweet! Enjoy! I put everything in the crock pot! All of my beets from the garden were cooked that way before freezing ( no foil, just cleaned and trimmed), acorn squash, kobacha squash, butternut. ..it works great. How much water? Still learning how to use the crock pot. No water! Just throw them in! Can yoy water bath can the puree after it’s done cooking to help preserve it longer? Please don’t waterbath pumpkin, pumpkin butter or butternut squash becausw it is too thick to process safely this way. It must be pressure canned in small pieces, not pureed. Cut it into small pieces, add water on light syrup and pressure can it. Thats the only way to be safe. Wish we could! I would have a shelf full! When you use the pumpkin purée to make pies what spices do you add? The same as with canned? I add lots of cinnamon, all spice, and a touch of cloves. More pumpkin pie spice uses some nutmeg but my husband doesn’t love it so I normally leave it out. But yes, in general, I just treat it liked the canned stuff. It has a higher water content though so if I feel like the recipe is sensitive I might let it drain a bit in cheesecloth before using. I used this method and made a streusel pumpkin pie. The recipe will be on my site tomorrow with a mention to head over and check out this post. LOVED it. Pumpkin innards are easier to remove when cooked. We cook pumpkins seeds and all. Yup, yup….worked like a charm! Either I was lucky enough to get exceptional sugar pumpkins this year or oven roasting them really changes the flavor, for the worse. Made a pumpkin pie that I didn’t have to drown 3 times in whipped cream to choke down……and your biscuits…..still droooooooooling…….. Your comments have had me laughing out loud! I can just hear you saying them, you type just like you’d talk and I love it. Thank you! I’m so GLAD I came across your post on Pinterest! I grew a variety of pumpkins for the first time, including the sugar pumpkins, and when temperatures soared over 100 here in Southern California for several days in a row, four of the pumpkins, for lack of a better term, “wilted,” on one side. Now I know what to do with them! I’ll cut out the ruined parts and toss them in a crockpot! Thanks for the great idea, and making me feel better about my previously known as ruined pumpkins…now they have a GREAT purpose! Yay!!! You will LOVE the fresh pumpkin. I like to even eat it as a side dish like you might mashed butternut sqaush because it’s just so different than canned pumpkin. Enjoy! I bought a pie pumpkin for my dog. This looks like the best way to cook it. Thanks! Yes! Pumpkin is great for dogs! Have you tried it on low? Maybe twice as long cook time? My days are such that i cant be there to turn it on then back 2-3 hours later to turn it off and i don’t have one of those fancy pots with the timer setting 🙂 thanks! 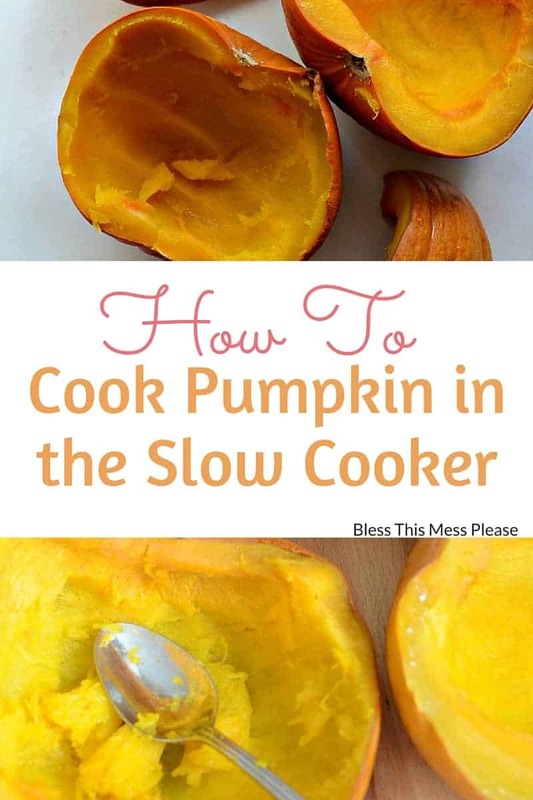 Yes, it works on low and the cooking time just depends on how big/thick/much pumpkin you stick in there! I’going to try tomorrow on my Halloween pumpkins so I can fresh pumpkin pies! I love pumpkins! I’ve grown them, boiled them and sautéed them. The water from boiling can be used too. I will try your slow cooker method. Thank you! 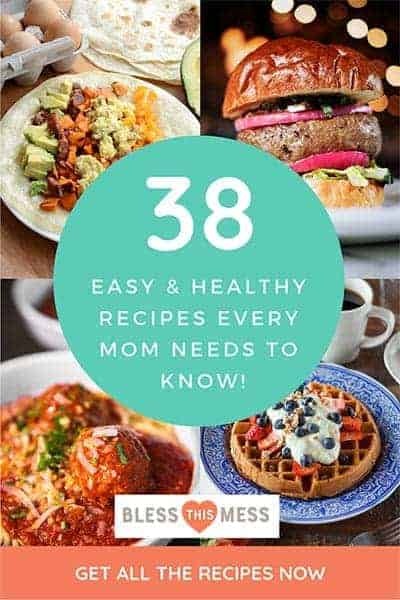 You’ll LOVE how easy it is to cook them! Set it and forget it! Can you eat it without pureeing it? Like just chunked out on a plate as a side. If like to try it without the added sweetness most of us are accustomed to. Get the natural taste of it with salt maybe. Is this recommended? Thank you your video and article are wonderful and look amazingly delicious. Yes, yes, yes! Most people don’t but you sure can (and we do!). There are SO many kinds of pumpkins and hard squashes that you can cook like this with all kinds of different flavor profiles. I’d hit up the farmer’s market and find some recommendations on new to your pumpkins for eating. I have a recipe post for roasting pumpkins and squash too, it’s also a great way to cook them for eating! 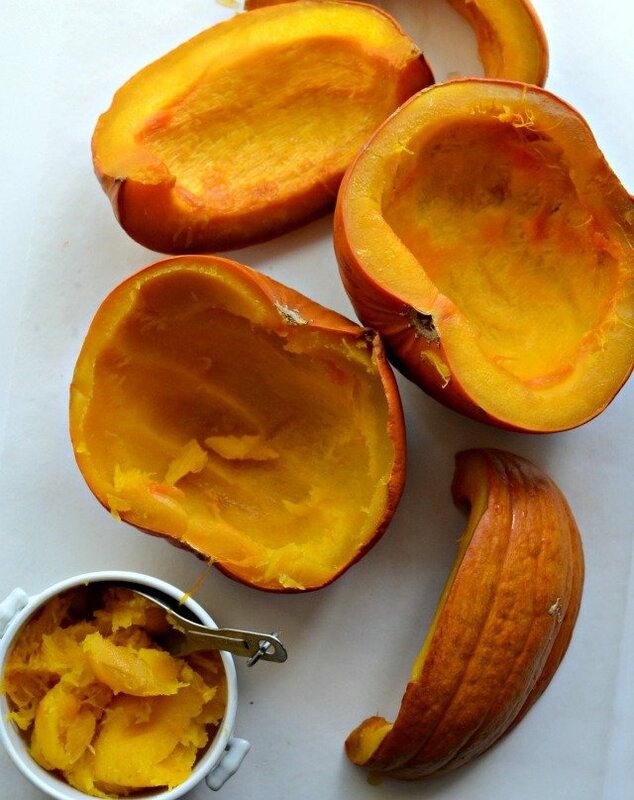 I cook homemade pumpkin pies every year and this is by far the easiest way. I won’t cook my pumpkins any other way. Thanks for sharing! Me too! Set it and forget it! So glad you liked it as much as we do and happy pumpkin pie making.